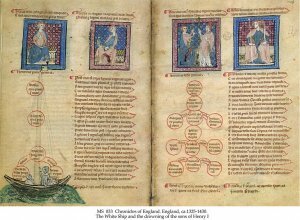 Description	 MS in Latin (texts 2-9, 12-14, 16-26,28), Middle English (texts 1, 3, 10, 15), French (text 11, 14) and Gascon (text 27) on vellum, England, ca. 1325-1430, 180 ff. (-3), 21x15 cm, generally 2 columns (17x10 cm), occasionally single column, (16x8 cm), 39-41 lines in Anglicana book script of varying formality and quality by Bernard of Graves (texts 11,16,27) and 15 further scribes. Headings in red, initials throughout in blue with red penwork with flourishes and yellow wash, one large illuminated initial with white penwork, 13 portraits of English kings in red, blue or gold frames with diapered ground, one is a contemporary portrait of the Black Prince, one large illuminated miniature of a university classroom scene, and one 3/4-page miniature of the White Ship showing the drowning of the sons of Henry I, 3 royal armorial crests tricked in gold and full colours. 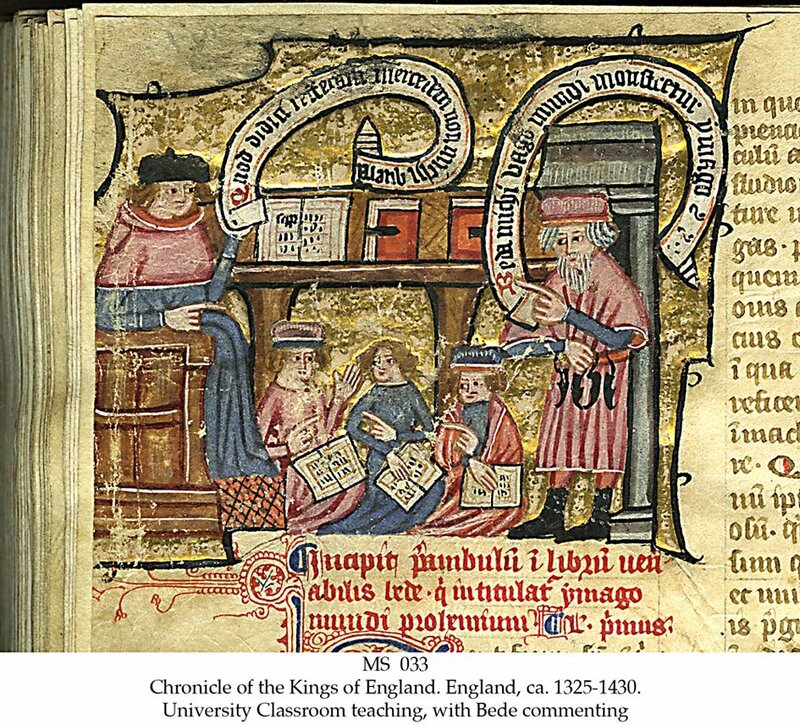 The miniatures are by 5 artists reflecting styles associated with Cambridge in the 1340's and London in the 1390's. Binding	 England, early 18th c., mottled calf with blind-tooled border, sewn on 4 bands. Provenance	 1. Bernard of Graves, London (ca. 1375-1400); 2. Possibly King James VI of Scotland (16th c.); 3. John Napier of Merchistoun, Scotland (17th c.); 3. David, Earl of Huntingdon, Scotland (17th c.); 4. Colonel Robert Graham of Grahamstown, South Africa (19th c.); 5. Christie's 25.6.1986:208; 6. H.P. Kraus, New York. Deaccession October 2010. Commentary	 Probably a Royal MS, which has accompanied kings on their travels to France. 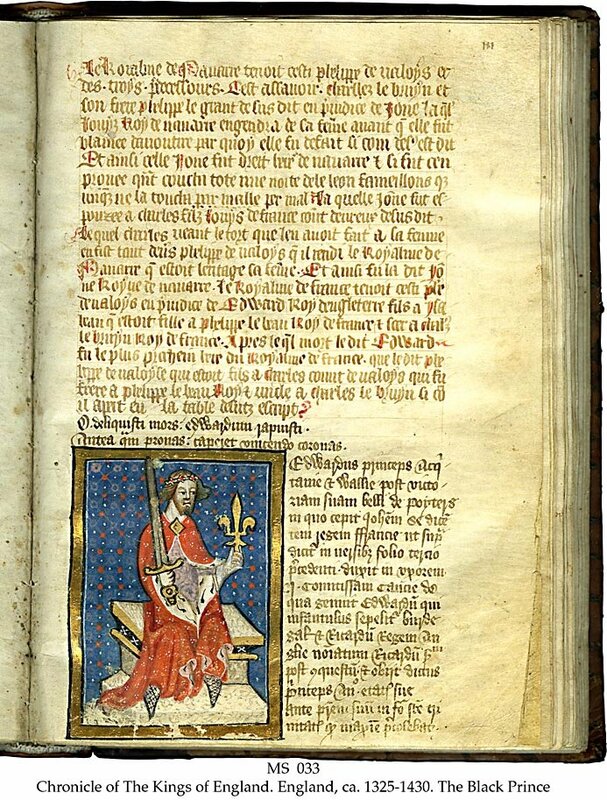 Text 19 has a colophon that records 4 stages in the transmission of the text from its discovery in the Church of Vienne, naming both places and scribes until at last copied by Bernard of Graves, giving a quite extraordinary insight to the process of transmission in manuscripts. 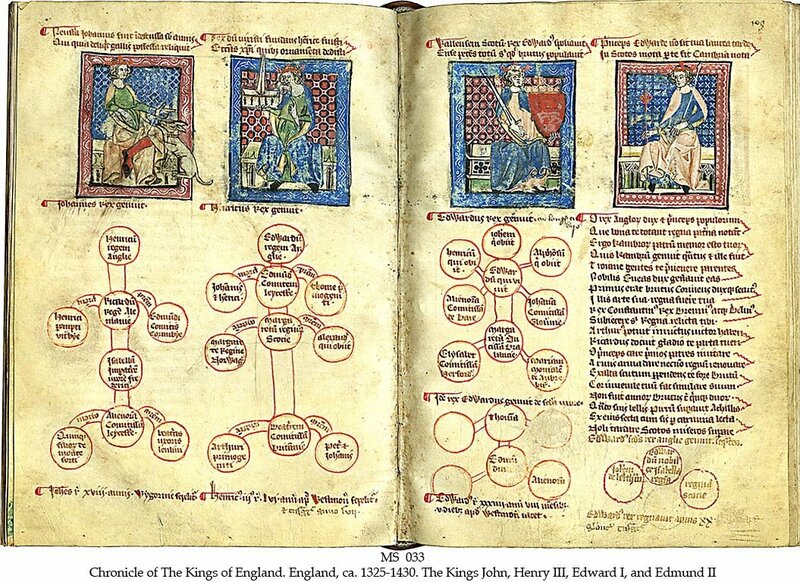 Portrayals of Edward the Black Prince and of King Richard II are extremely unusual. 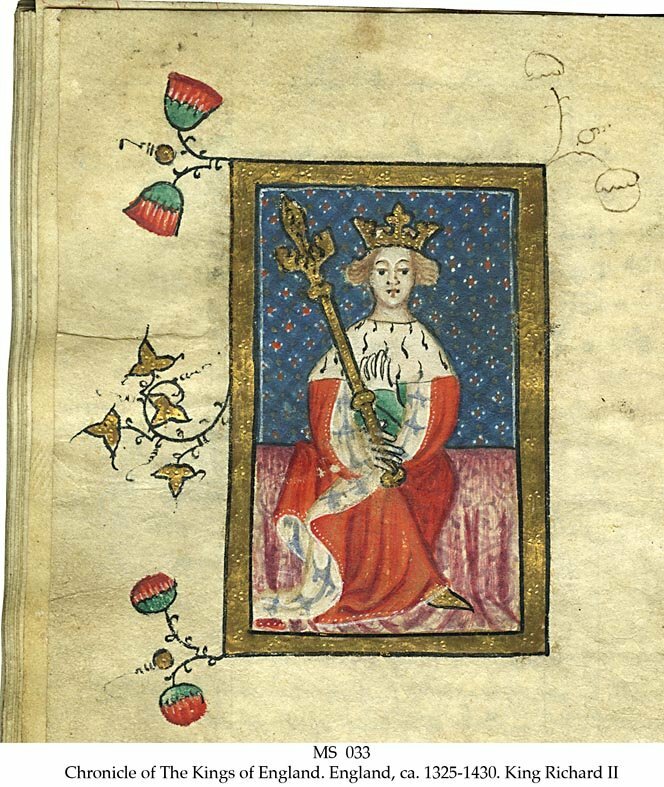 The artist may be identified with the illustrator of the Belknap Hours and of Bodleian Library MS Bodley 581 Liber Geomancie, possibly owned by King Richard II.